RAISE UR PAW NEWS: ADOPTION ANGELS CAMPAIGN ---- MAKE A STAND FOR SECOND CHANCES! ADOPTION ANGELS CAMPAIGN ---- MAKE A STAND FOR SECOND CHANCES! HELP RAISE PUBLIC AWARENESS TODAY! With the countless numbers of innocent lives within shelters and humane societies, it is truly an imperative wake-up call to all of us as individuals to play our active roles in helping these companion animals find their forever homes and second chances at unconditional love and life -- and that through this eye-opening reality, we can come together as a unity, to achieve these hopes that these lives are in desperate need of. 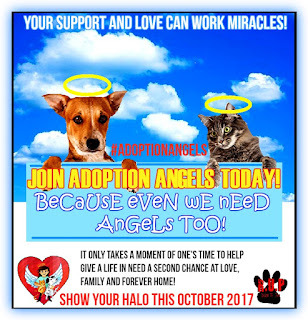 Our "ADOPTION ANGELS" Campaign, was designed and established to promote adoption/fostering of companion animals from shelters and humane societies internationally and raise awareness of the millions of innocent lives who are waiting to be adopted/fostered by loving and compassionate individuals, like yourselves, in hopes of second chances. With the need of this imperative campaign, the use of this valuable message "Because Even Sheltered Animals Need Angels Too" -- not only shows support, but will also increase the hope that we can exceed the initial expectations to generate foster and adoptive homes for sheltered animals internationally, and provide the necessary means in order to achieve this mission in which we are launching. WHY YOUR HELP AND SUPPORT IS IMPERATIVE!! Through the efforts of compassion, it is up to us as humanity to highlight the need for such valuable and loving environments that are in dire need of, and tackle the lack of adoptable and fostering homes by recruiting and empowering individuals worldwide to aid and support the approach to giving these lives and second chances. We, at Raise Ur Paw, are truly hoping to count on your support to help with the success of the #AdoptionAngels Campaign that is set to launch --- and express your immediate and urgent interest and actions to help fulfill these hopes and dreams of such loving and beloved sheltered animals that depend on us every day --- and make such hopes and dreams a reality. WAYS THAT YOU CAN HELP & SUPPORT THE CAUSE! Recruit and Empower Individuals Internationally to Help with the cause by sharing sheltered animal pictures, spreading awareness, sending out the message of hope to increase chances for loving homes and families. Use the hashtag #AdoptionAngels --- and share imperative information on the issues/actions etc that leads innocent companion animals in the confines of shelters and humane societies around the world. Volunteer or Donate to shelters and humane societies to help with providing essentials needed, and to show that you care & support. launch an event for fundraising or hold your own presentation in increasing the awareness needed to help these innocent lives get their forever homes and families. Use your social media platforms as a foundation to help lives, post pictures, information, your own creative designs to promote the efforts. Or if you adopted/fostered an innocent life, share your experience and images to encourage others to do the same. Together United we can achieve success through this campaign and improve the chances for future homes and families for sheltered animals around the globe --- because after all sheltered animals need angels too, and we as humanity can be just those angels they need.